The future has come to school library design and architecture. No more doors, no more 'shushing' . 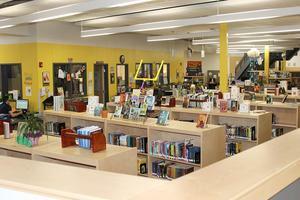 . . Today's public school libraries are the epicenters of the school. The two new middle schools in Comal ISD, Danville and Pieper Ranch were designed to promote learning throughout their campuses. While they still feature traditional classrooms, they also feature comfortable seating areas outside those classrooms with walls that serve as white boards or screens, and their libraries serve as the campuses’ epicenters. While typical school libraries have a door and a “quiet please” sign placed predominantly for everyone to see, DMS and PRMS libraries have no doors, no “keep quiet” signs, and they are located literally in the center of the campus. During passing periods, students can return or check out books, stop to ask a quick question, print a paper, or just say, “Hello,” to the librarian. 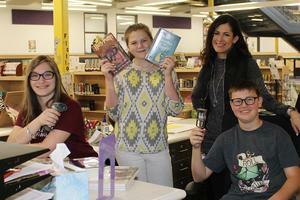 “Libraries are more than just a place to house books,” agrees Melissa Zipp, librarian at DMS. “With the location of the library at DMS central to the academic area and open for passing periods, I believe students have gained more access to the learning commons and myself. PRMS Eighth Graders Brooklyn Webster and Autumn Nelson have enjoyed being able to stop by the library whenever they have the chance. They also like how comfortable the area is, saying they often sit on the floor to read or study. Both Powell and Zipp agree that the open-concept library has created an increase in library use. 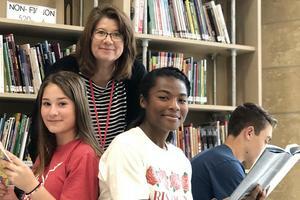 -Eighth Grade Student Aides from left Brooklyn Webster, Autumn Nelson and Joey Siskey help Pieper Ranch Middle School Librarian Jessica Powell shelve, organize and register books. -Pictured are eighth grade students from Danville Middle School with DMS Librarian Melissa Zipp. From left is Maddie Colhoun, Zipp, Grace Conley and Jackson Reed. 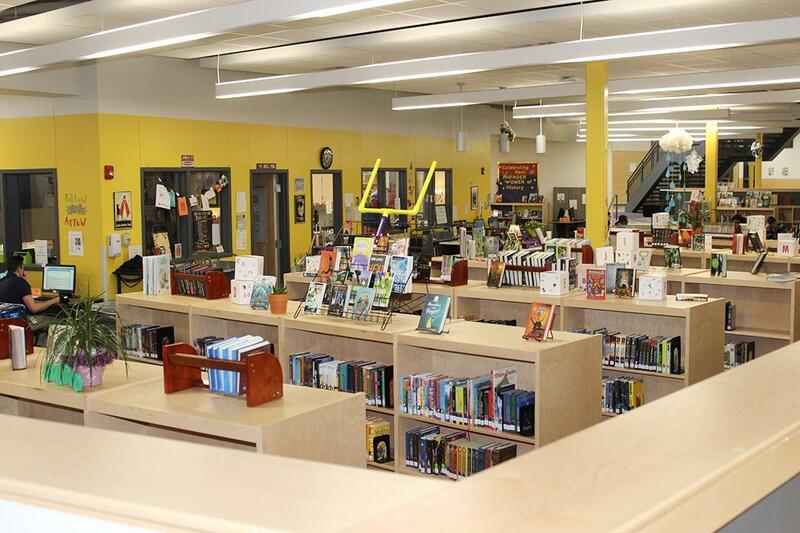 -An overview of the open-concept library at Pieper Ranch Middle School.